HOUSTON -- Bears in gold and silver have been especially active and vocal over the past while. We have come to expect that when gold or silver or both are flirting with obvious important technical support levels ($1,525 for gold and $26 for silver). But the bear’s dour salesmanship that the precious metals Bull Run is “over” is not a convincing story to the largest holders of precious metals exchange traded funds (ETFs). How do we know? Well, if the largest holders of precious metals ETFs thought the bear’s predictions of a major breakdown ahead were right, shouldn’t those elephant-size holders of metals ETFs be rushing the exits in, for example, the SPDR Gold Trust (NYSE:GLD) or the iShares Silver Trust (SLV)? The thing is, they are not rushing the exits. Both of the precious metals ETFs are managed by authorized market participants (AMPs) who arbitrage the spread between the current per-share net asset value and the price of gold or silver. So when the share price of the ETF diverges from the per-share NAV from either excess buying or selling pressure, the AMPs end up either adding or removing shares (and metal) so that the price of the ETF tracks in lock step with the price of the metal, less accumulated fees and expenses. That may sound complicated, but it’s actually very simple. When there is more buying pressure than selling pressure the AMPs have to add shares and metal (which they do in prescribed minimum basket size). When there is more selling pressure than buying pressure, they have to remove shares and metal and earn money by doing either. It’s great work if you can get it. With that in mind, with gold having just tested implied technical support and the vocal gold bears pounding the table that the metal is on the verge of breaking that support (on its way to revisit three-digits territory “imminently”), one might think that the big holders of shares in, say GLD, might have been getting the heck out of their long positions. If the Big Guys who hold GLD were in ‘getting-out-of-Dodge’ mode we can reasonably assume that would cause some very noticeable negative liquidity (more selling pressure than buying pressure and thus, fewer shares outstanding and less metal being held). 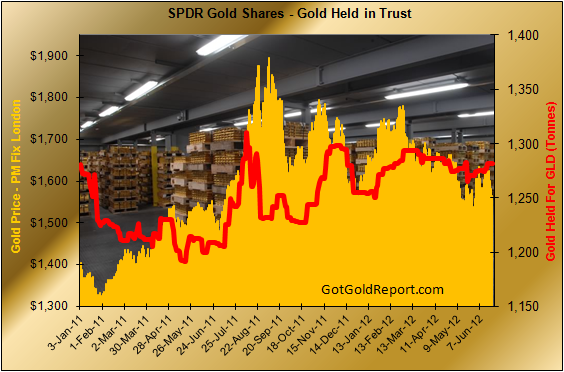 So do we see a falling amount of gold being held by the big gold ETF? Nope. Even though gold has pulled back from its September 2011 highs near $1,900 – to not far above $1,500 – the most popular gold ETF is holding more or less about the same amount of gold it did when gold cut new highs looking at the long-term chart above. In fact, if we use Sept. 6, 2011, as the interim top for gold, when it closed at $1,895 in London, GLD held 1,232.31 tonnes of gold then. As of Wednesday, June 27, 2012, with gold $325 cheaper in the $1,570s as we write, GLD reports holding 1,281.62 tonnes, or not quite 50 tonnes more gold than at the top. A land developer, professional numismatist, self-taught bullion trader and investor since 1980, Gene Arensberg analyzes technical and fundamental developments in the precious metals markets. In 2000 Gene started sharing his own market research with fellow traders and fund managers. 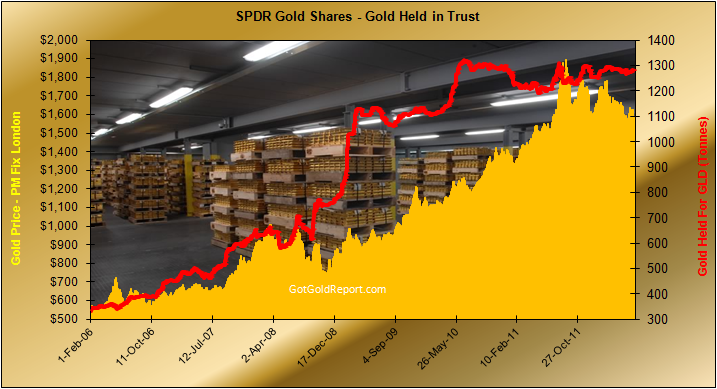 Those email reports evolved into his popular Got Gold Report, a biweekly look at important indicators for gold and silver published on the web. Gene's more in-depth market reports, insights and trading ideas are available at www.GotGoldReport.com.